In the future, the imprinting technology is rampant. A small group of survivors known as actuals stumble across what remain of the dollhouse. They are not ready for what they find. To take the Epitaph story line and correct the flashbacks and make them sync up with the actual events of season 2 yet remove the horrible season 2 end plot. 106 – Man on the Street: Used the TV footage scattered throughout the episode to create the intro to the movie. 204 – Belonging: I used a clip from this for a flash back to show how Sierra became a doll. 208 – A love supreme: Use a clip from this for a flash back to alpha and paul. Will not mention the scene due to spoilers. Great job Juice. The editing in this fanedit is marvelous. I am a bit of a stickler about tv-to-movie edits. This stands on its own well as a movie. The story might be a little confusing if not familiar with the Dollhouse show, but I think more than enough info is given, and it is fine to expect an audience to meet you halfway on a sequel-type story. It is very much akin to Serenity in that somebody could watch it independent of the show if they wanted, but familiarity with the show enhances the experience. I really enjoyed this edit, though the narrative in some aspects is a little weak. The first half of the story is following characters that ultimately are just supporting characters. 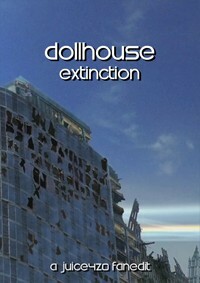 Juice4z0 has done a masterful job of reworking the series finale(s) for Joss Whedon's TV series "Dollhouse." The two "Epitaph" episodes, showing the various futures of the characters, have been combined into a feature-length finale. Flashbacks that contradict one another have been removed, and Juice has replaced those scenes with "flashbacks" of regular footage from the series' two seasons that explain the show's central premise and main character interactions in a way that, if this was the only "Dollhouse" that a viewer saw, everything would still make complete sense. Long-time "Dollhouse" viewers may be surprised at the absence of two major characters from the series, but since their stories do not reflect directly on the events of the "Epitaph" storyline, and would have in fact overburdened this story, I think Juice made a wise decision in leaving them out. In addition to the flashbacks, Juice opens the edit with scenes from "Man of the House," a Season 1 episode that told much of its narrative through a news report that explains the central premise. This editing choice is so elegant, and makes the story so accessible, it makes me wish that the series itself had actually started with these scenes. The "new" flashbacks are so seamlessly edited into the footage that if I hadn't already known that those scenes didn't belong there, I never would have guessed. And the pieces chosen underscore the current action of the story so well that scenes took on an added emotional wallop. I took off a couple of points for A/V quality because I had some trouble seeing and hearing the edit to some degree, but I was never able to conclusively determine that the trouble was not actually on my end with my computer. Please don't let my rating in this area deter you from giving the edit a chance. Hopefully, a future reviewer will be able to shed more light onto whether or not there are actually any A/V issues or not. Writing this review has in fact made me anxious to watch the edit again. Whether you thought the original "Dollhouse" was masterful or flawed, this edit will make you appreciate the series in all new ways!